If you want to use it to overwrite the old files – you shouldn’t. There’s auto-delete section in destination settings that allows you to set auto-delete for old files after a specified number of month/days. If you store files in Dropbox or other cloud storage that supports versioning, you may choose no date format so that the new file overwrites the old, but Dropbox takes care of storing all the versions of the file. If you use a script to restore a database on another server, than you may want to use no date file naming. Note however that very soon we will be releasing “Restore job” functionality that allows to set up replication without custom file names. How to set a custom format? 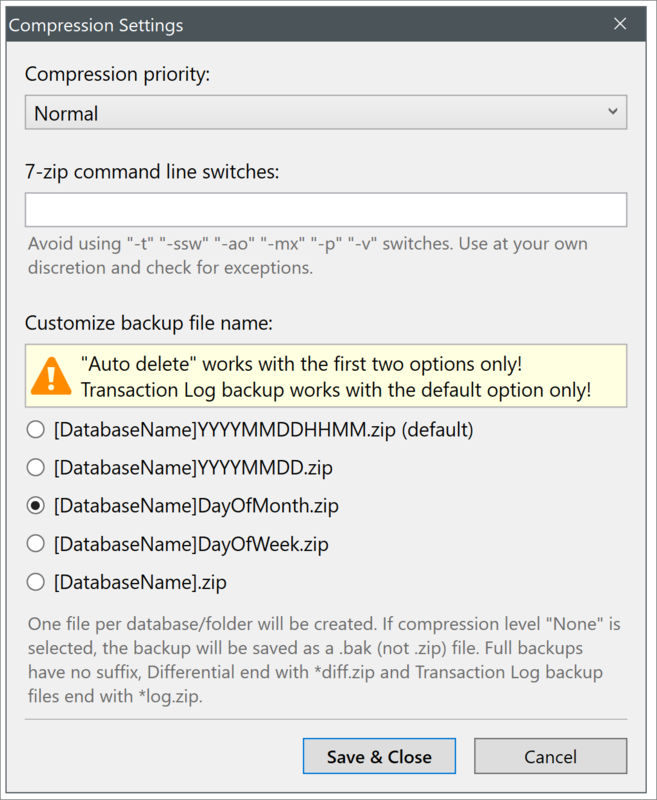 By using custom backup file names you are breaking a few things, so before you do that, make sure you are very clear of the trade offs. Tran log backups should not be used with any custom format because they’d overwrite each other. overwrite the full backup file made on the same day and would make the restore impossible. Only basic full backups should be used. The automated restore (the one done through our interface) would work only in basic full backup restore scenarios. Basically, you have to know what you are doing if you are using custom formats.